A Boston lawyer, Eli has weathered an intense year of public scrutiny and police investigations after being accused of - but never arrested for - the murder of his soon-to-be-ex wife. Possibly the narrator ruined this story for me - I didn’t enjoy his voice, it was whiny and his attempt at female voices was pretty awful. The story in itself wasn’t Nora’s best. I normally like her heroines, but Abra struck me as a pushy know-it-all. If I could have returned this book, I would have, but for some reason it didn’t qualify as a return. A disappointing waste of a credit. Narrator cannot do female voices. Good story but had trouble finishing as the narrator portrayal of female characters was poor and distracting. I loved the story! But I think I loved Luke Daniels more! He is very well spoken, and made me feel as though I was in the book! He portrayed the characters very well I thought, and gave them life and a spirit!!! Very well done!!!! Nora Roberts doing her thing. I like Roberts - she's a good writer. Good at establishing the setting and culture, good at developing character, good at creating a mystery, and good at a believable love story. 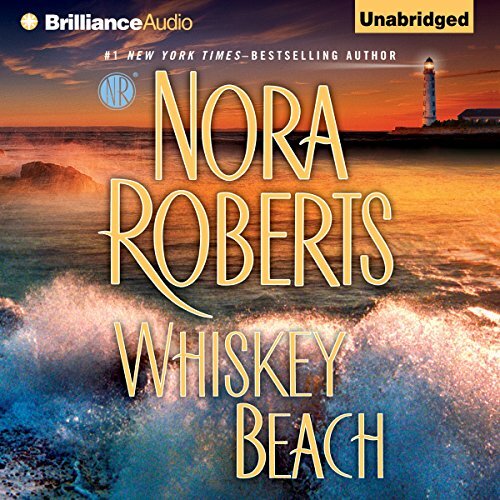 All this is true of Whiskey Beach - it's a good book and I enjoyed the neck out of it despite figuring out whodunit long before the big reveal. I do not like this narrator though. Specifically, his female voices made my teeth hurt. He made Abra sound like a stereotypical valley girl instead of the intelligent, well educated east coast woman Roberts wrote. Read Whiskey Beach for yourself. I am glad I got the audio book! Very good story with excellent performance with a few twists till the end. Would recommend on#Audible1. I absolutely love it. I read the reviews and was really worried about getting it but I am so glad I got it. This is a great story. I love the characters (Abra is just AMAZING). I ADORE Luke Daniels. He makes books really come to life!!! What would have made Whiskey Beach better? If all her plots were more researched. Feels like she is getting lazy as she's using nearly exactly the same formula and recycling plot lines of many of her books. I really used to like her, but please, oh please... never use the quote "Dumb as a box of hair" again. She has used this eloquent quote in several books now. There are many more insulting comments she could use, trust me, I'm a teacher. Feels like she is recycling plot lines. Its all sounding the same. Literally, all female characters have a difficult past, overcoming a current insecurity, happen to be thin and beautiful, horribly opinionated and quite stupid. The guys all happen to be good, stand up men who are going through personal crisis and usually both charachters 'take the law into theie own hands' as they forgo common sense and 'risk it all' for love. All that changes is charachter name, career, a few personal details and location. Otherwise, its a fill in the blank template. He's not so bad, but a woman for a womans voice would be nice. But its just obvious hes trying his best, but, even he sounded bored in some parts of the script. If you could play editor, what scene or scenes would you have cut from Whiskey Beach? I would eliminate innane comments, which make up half the book. They are stumbling blocks over the stoeyline and what makes the story sound repetitive. I like the old man at the bar, it was a nice character who had just enough 'screen time' to make a scene interesting, provide key information, gave meat to the story, and mentioned in passing before disappearing. The rest of charachters are waaaay to chatty and overthink a situation. Nora does have a way with words, she can make a descriptive scene but bogged down by her past plot lines. Can you get a woman who is in her forties, a little soft, tired and has a intersting backstory but is revitalized by love, personal transformation, not trying to solve a puzzle but gets swept up in getting involved with life, finds new goal, happiness in achieving and finding the guy? Her target audience is getting older, and kinda tired of reading about mid twenties love stories. Life gets more complicated and interesting after forty anyways. Oh what a satisfying Read! Daniel getting caught in the act! I really enjoyed this book. Some might think it is typical Roberts & I guess it is but it is good nevertheless. Berkot did a great job narrating too. I would listen to him again & I definitely will read/listen to Nora again. This was not an enjoyable experience for me. I don't normally complain about a book being too long but this one sags and drags. I did not bond with the characters or the improbable plot. There was no suspense for me. Very repetitive and farfetched. The narration was okay, it was the story that disappointed. The storyline in Whiskey Beach would have fit perfectly into a short story format. It was frustrating to stop knitting and fast forward through the tedious parts, of which there were many. I listen to Nora Roberts when I'm in need of some light entertainment. This was a tedious slog through nothingness. No more Nora Roberts for me. In my view, the narration was fine. It's hard to do much with a dull storyline. I won't disagree that this is not Nora Roberts' best but I always enjoy characters that overcome their circumstances. Narrator was not my favorite but not detracting either. Not all that well written. Basically it's unbelievable. Roberts must have had a great massage and thought describing it was enough. Characters not interesting. Fantastic story line! I recommend this story to any that reads Nora Roberts stories. The descriptions make it so the reader/listener feels like you can visualize the story.